(Reading, Writing, Arithmetic) are the basis of a solid education. 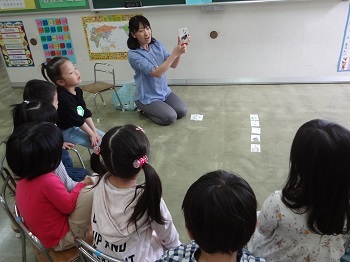 At International Yamanote Kindergarten, we practice everyday letters and numbers. By studying the letters and numbers that the children use in their regular lives through our original work sheets, we help them to get a head start on school. Using calendars and clocks, books with noticeable words and numbers etc, we can draw the interest of the children. Through counting people and things, dividing things into groups etc, the children are able to grasp the importance of numbers to their every day lives. The children are taught to properly hold their pencils as they practice drawing straight and curved lines. 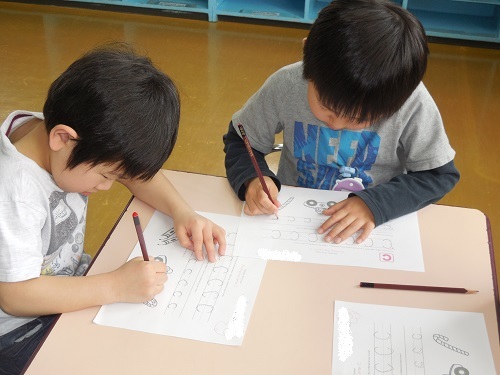 Using Hiragana prints the children learn the correct method for writing the different characters. They practice numbers up to 30 and also learn to count in 5’s. They practice AIUEO haiku to broaden their vocabularies and improve their pronunciation. 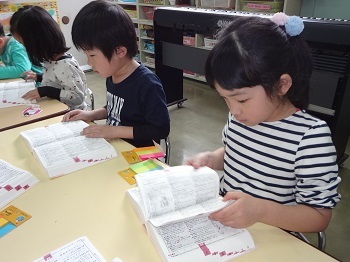 Senior children are challenged to make haiku poems and use a dictionary to the letters and number prints they use. The seniors also make a special picture book with a story all of their own devising as a memento for after graduation. Even though the primary goal of the class is English, numbers and Japanese characters are not neglected. The Japanese teacher ensures that the characters are learned properly and the children can count in Japanese correctly as well. The children increase their abilities in both their mother tongue and their second language (English).